Obituary for Kathryn "Kay" (Litzenberger) Merge | Laughlin Memorial Chapel, Inc.
Of Mt. Lebanon, passed away peacefully on Thursday evening, April 4, 2019. Daughter of the late Alvene and Nellie Scott Litzenberger; beloved wife of the late George F. Merge, Jr.; loving sister of John S. Litzenberger (Barbara), the late William K. Litzenberger (June) and the late Joel Litzenberger; dear sister- in- law of Eugene E. Merge (JoAnn), Joan Merge Gainer, the late Joycelyn Merge Eckenrode (the late James B. Eckenrode, Jr.) and the late James R. Merge; devoted aunt of Dr. Christa Litzenberger (Patrick Stearns), Jean Merge, Gary Merge (Kimberly), Lisa Walters, Patricia DeWitt, Rebecca Rogers (Larry) and Michael Narigan; also survived by her many great-nieces and great-nephews. Kay received her Bachelor Degree from Chatham College. She went on to have a long career as a buyer and manager for Surrey Women's Clothing at their stores in downtown Pittsburgh, Shadyside and Mt. Lebanon. 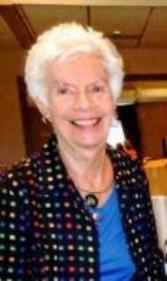 She was a longtime member at South Hills Country Club where she served as Handicap Chair and Board Member for the club's Women's Golf Association. Kay also represented South Hills Country Club on The Western Pennsylvania Women's Golf Association. For many years she served as a member of St. Clair Hospital Foundation Golf Committee and also was active in many other civic organizations. At her request, viewing hours have been omitted. All are welcome to attend her Funeral Service in the Mausoleum Chapel at Queen of Heaven Cemetery, 2900 Washington Road (Rt. 19-S), Peters Township (McMurray), PA 15317, on Friday morning, April 12, 2019 at 10:30 (EVERYONE PLEASE MEET AT THE MAUSOLEUM CHAPEL). No Flowers, Please. In lieu of flowers, please consider a contribution to Sisters of the Holy Spirit, c/o Marian Manor, 2695 Winchester Drive, Pittsburgh, PA 15220 or to Little Sisters of the Poor, 1028 Benton Avenue, Pittsburgh, PA 15212.